Art in it all essential being is there to inspire, motivate, tell a story and provide an emotion. Most of all, each artwork has the power and role to express and show specific opinion and a story. For that exact reason, an artwork is a perfect decorative element for creating a focal point in the bedroom, since an artwork above the bed breaks through the plain appearance of the walls. Nothing can draw attention, more like a solid and beautiful art can. Unique and valuable art piece above the bed will work for a great focal point and will provide the bedroom with a specific identity and a story. Whether you want to go with a traditional art piece or a creative wall decal, art will help you to enhance the aesthetics of bedroom and create a unique and beautiful bedroom. Below you can check some bedroom designs that have created a perfect focal point with the help of art. As you were able to see art can provide the soul to the interior. Aside of the aesthetical aspect, the art that you choose can tell a lot about you and your personality. A contemporary art piece above the bed represents your dynamic tempo of living and open mindness, a quirky oil on canvas tells that you are person of style who appreciates quality and classical art, a monochrome drawing above the bed can describe you as person who love simple and yet meaningful things in life. Therefore, when you choose artwork for the bedroom or for any other interior don’t focus that much on the aesthetics or how it will adapt in the room, associate artwork with your inner energy. 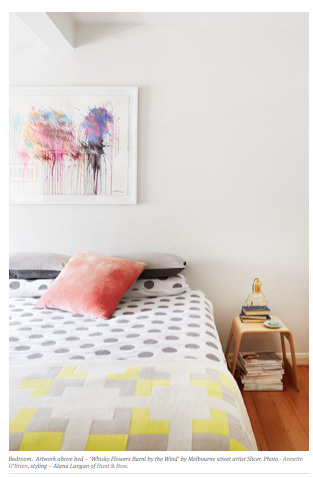 Anyhow, artwork in the interiors work as a great eye catcher and may work as a perfect focal point in your bedroom. Tell us what kind of artwork will look perfect above your bed, and we will tell you what kind of personality you have. And don’t forget embrace art because art is an eternal capture of an emotion.